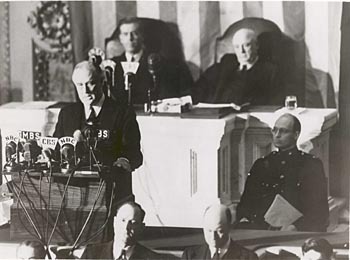 After the December 7th, 9142 attack against the United States at Pearl Harbor, then United States President, Franklin D. Roosevelt delivered a memorable speech to Congress. He gave his speech on December 8th and called on the citizens and government of the United States to respond to the Japanese attack on Pearl Harbor, with the United States' entry into World War II. Below is the text of Roosevelt's speech. Yesterday, the Japanese government also launched an attack against Malaya. Last night, Japanese forces attacked Hong Kong. Last night, Japanese forces attacked Guam. Last night, Japanese forces attacked the Philippine Islands. Last night, the Japanese attacked Wake Island. As Commander in Chief of the Army and Navy, I have directed that all measures be taken for our defense. But always will our whole nation remember the character of the onslaught against us. No matter how long it may take us to overcome this premeditated invasion, the American people in their righteous might will win through to absolute victory. I believe that I interpret the will of the Congress and of the people when I assert that we will not only defend ourselves to the uttermost, but will make it very certain that this form of treachery shall never again endanger us. Hostilities exist. There is no blinking at the fact that our people, our territory, and our interests are in grave danger. With confidence in our armed forces, with the unbounding determination of our people, we will gain the inevitable triumph -- so help us God. ​I ask that the Congress declare that since the unprovoked and dastardly attack by Japan on Sunday, December 7th, 1941, a state of war has existed between the United States and the Japanese empire.